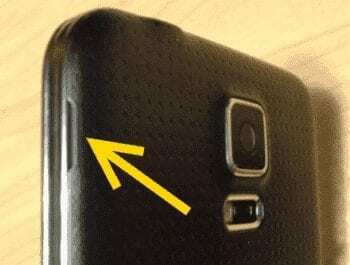 Taking the rear cover off the Samsung Galaxy S5 to access the SIM Card or Batter can be a bit tricky. It seems almost glued to the device since it’s designed to have a water tight seal. In this tutorial though, you can learn to remove the rear cover with ease. Just follow these steps. Power the Galaxy S5 off by pressing and holding the “Power” button until a dialog appears on the screen. Place the phone face down on a flat surface. Find the tiny notch located on the upper-left part of the device. Starting with the notch, gently peel around the area to pry it from the device. The rear cover is a bit flexible, so it is not as likely to break as you might think. To insert the battery, side it into the compartment with the gold connectors down and aligned with the camera lens. Then push the bottom of the battery into the bottom of the compartment. To remove the battery, use the tiny notch at the bottom of the phone and battery to pry the battery out of the compartment. 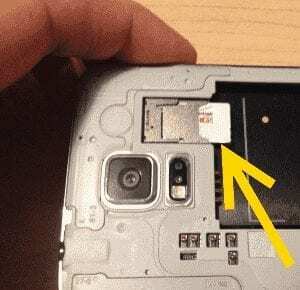 To insert the SIM card, push it into the slot with the gold connectors facing downward and the notch facing the camera lens. Push the card in until it stops sliding into the slot. To remove the SIM card, push gently down on the card and attempt to slide it out. You may have to wiggle it back and forth until it finally gives. Once loose, gently pull the card completely out of the slot. Snap the case around the camera lens, then work from top to bottom. Slide and push to ensure all areas are snapped into place. So glad you showed the photo because that notch is very tiny. I did it in a snap. Thanks! I suppose it could simply be a third party backing. But I would be led to believe you have a different phone than an S5. you didn’t answer the question What if my phone has no notch? Mine doesn’t either. Do i have a different phon? Nice clear instructions. Changed the battery quickly with your help. Thanks so much!! I ordered two new batteries and used your very fine instructions to install one of them. All went well until I turned on the phone and then…nothing. I tried both batteries but still no screen. Do I need to charge the new batteries now? What if there is no notch. My backplate is tight to the phone? Any ideas please. I have the dreaded black screen and needed to remove SIM card and battery. Thank you so much for the great tutorial! I am a 75 yo senior who thanks you sooooo much. keep up the good work. We seniors still have so much to contribute..
It’s amazing what you can do yourself — if you have simple directions and pictures…THANK YOU so much from a Senior Citizen…. I had no clue! I read your instructions and looked at your pictures. I did it without a hitch. Thank you so much. THANK YOU VERY INFORMATIVE SOLVED MY PROBLEM IN 4 MINUTES. Thanks. The picture of the tiny notch was just what I needed! I think you have described the whole process very precisely,. Also, I feel that it is very easy to perform it.